A landlord has a cocaine habit. He writes off the rent owed to him by the woman who rents his cottage because she gives him a free line when he asks about the back rent. The woman has three daughters, all of whom she neglects. Then she gets arrested and the landlord and an uncle of the woman must venture into the cottage to look in on the girls. The cottage is a disgusting mess, and the crib and playpen of the two younger daughters are jerry-rigged prisons secured by padlocks. The children are taken away from the mother who, dependent on the child subsidy in her welfare check, quickly gets herself pregnant again. Kerry West’s “Shame,” summarized above, is one of the poignant stories in the new anthology, The Cocaine Chronicles, edited by Gary Phillips and Jervey Tervalon. This is one more in Akashic Books’ anthology series dedicated to exploring drugs and drug addicts. 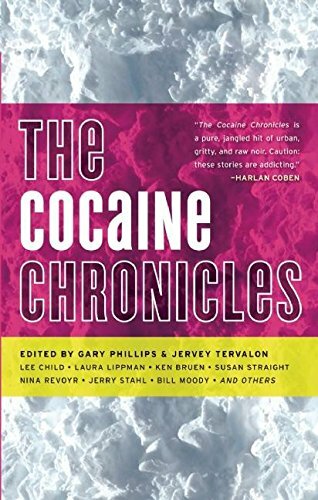 Nearly two thirds of the stories of The Cocaine Chronicles are stark, sad character studies. James Brown’s “The Screenwriter,” for example, is a touching portrait of a mid-level Hollywood writer whose worsening addiction has imperiled his career and family. A friend takes him to a high-end rehab center where readers gradually learn that the man nearly killed his family when he plowed his pick-up truck into his home. Brown leaves us optimistic that the man can kick his habit and return to work, but also understanding that the man will never reconcile with his family. Another example is the powerful “Golden Pacific” by Nina Revoyr, about the dissolution of a single parent family after the death of their youngest daughter. The mother and older daughter move to Los Angeles to start fresh, but the mother falls into crack cocaine addiction and prostitution. She abandons her 13-year-old daughter, who becomes a child prostitute for her mother’s dealer. While the anthology divides its 18 stories into four sections: Touched by Death, Fiending, The Corruption, and Gangsters & Monsters, the dividing lines between these sections are less significant than the continuum of stories themselves. The stories range from the dark and powerful character sketches noted above into clever crime stories in which cocaine is merely a prop for advancing a grisly plot line. Laura Lipman’s “The Crack Cocaine Diet” and Robert Ward’s “Chemistry,” for example, are mostly about the adventures of vanity-driven main characters who happen to use the cocaine. While both stories are well written, they may be better suited for one of Akashic’s well-known crime-story anthologies. Two stories appear even further out of step with the majority of the anthology. Bill Moody’s “Camaro Blue” is about a jazz musician who begins falling in love with an old female acquaintance after his car is stolen by a coke addict—the brother of his budding love interest. It is a beautiful quasi-love story, but the cocaine linkage is incidental to the story. And editor Phillips’s own “Disco Zombies” is mostly violent scrum—interspersed with discussion about cocaine and the re-uniting of old lovers. The story ends in a deadly battle against undead coke addicts. It is hard to reconcile this Night of the Living Dead-inspired story with the sophisticated character studies elsewhere in the anthology. In contrast to Akashic’s tightly organized and somber companion anthology, The Speed Chronicles [also reviewed in nyjb], Mr. Phillips and Mr. Tervalon bring forward a chaotic collection in The Cocaine Chronicles—which does not make it “worse” than The Speed Chronicles, but it does make The Cocaine Chronicles less literary. The best stories in The Cocaine Chronicles—including those of Mr. West, Mr. Brown, and Ms. Revoyr—are equal to the best fiction being written today. On the other end of the continuum are a handful of fun but less serious stories. The whole of The Cocaine Chronicles is less than the sum of its parts, but there are still plenty of diamonds interspersed among the rough stones.